As an adult I’ve found myself pursuing science education at a rate that would make my highschool self reel. Teenage me did the bare minimum in science class, and only when taking Physics as a senior did a spark of interest arise. The problem is that for most of us laymen the terminology and word usage by scientists is confounding. They insist on using words that have a different, or at least altered, meaning when translated over to the common colloquialism. In other words: 16 year old me wanted to put in the bare minimum of work, and these sciency jerks were making homework tedious. It makes things difficult when trying to explain simple concepts to a friend. For a time I was heavily into evolutionary biology, and not for political reasons. I found the whole concept and study of mutations within species fascinating. I still do. But I was once asked to explain how I could believe observable evolutionary mutations had existed in the wild, and not just forced in a lab. My mind was clear on the subject, but the words failed me. Because I relied on the words I’d read in scientific journals, or in newsgroup discussions. The word “evolution” itself is highly contentious. Scientists hold evolution as a fact, and have proven that it does occur. However there is a theory of evolution that is used to explain how it happens, and why. This is ever changing as new information is discovered. This is a principle aspect of the study of evolution that misinformed people use to prove evolution to just be a bunch of mumbo jumbo. 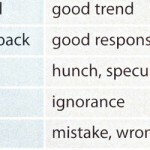 A table of words that are used differently by scientists than how the general public understands them appears in an article in Physics Today, showcasing just how dire the communication problem has become. 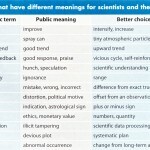 Scientists need to learn to communicate better with the public. We live in an age where information is the most valuable resource and obfuscating that knowledge with equivocation, even if unintentional, leads to more confusion. And more importantly it leads to necessary actions that need to be taken being argued over while our problems get worse. Click on the table in the gallery below to see the full image. i agree wholeheartedly, maybe then people won’t think global warming is a myth and there’s a reason to stop polluting, among other issues. scientists need to be better communicators or at least hire someone who is lol. people fear and discriminate against what they don’t understand. make it clear and humanity will be better for it. I have a high degree of science understanding. Global climate change is real. . . It has happened continuously for the entire age of the planet. . .and most detractors also understand that. It’s the AGW part I outright reject, as do many others. Certainly a fallacy given many other major contributors to the cause of climate change are largely being ignored or outright rejected by the CO2 enthusiasts. And people are starting to see self interest prevalence of that dogma, the financial gain to be had at taxing anything that emits CO2. Mike Stirton Problem is people without a high degree of science understanding can’t understand anything being said on the subject… and those people vote in larger numbers than people like you. It does not take scientific chatter to quantify that the dogma of AGW is flawed. And I would bet that many people stopped caring about AGW or climate change per se, when the AGW proponents realized the earth was not getting warmer, hence the name change to climate change. And it is a no brainer to many when faced with increased cost to living when carbon tax schemes come along…when you affect someone’s bank account, people take notice in a big way. cry wolf my friends,all just becuase we have the equipment to show us whats happenning 24hr unlike decades before . Were nearly equipt to make the climate change hurdel if only we pick what relevant just in time, just alike a giant freaking robot would, but shame on the mist of info overflow.. no one belives in dreams anymore, mistyfied. people read the media thats written by silly little girls who love to chat, we love to hear, we buy it, but they don’t know the scientifc lingo, which makes it even more worth the read,lol. Isn’t it funny how we have a common language and still our individual interpretations are different? i’m in the UK, how do you pronounce that over there ? uuk ! sounds like..